Before we can talk about Farrago, we should discuss what Farrago is. 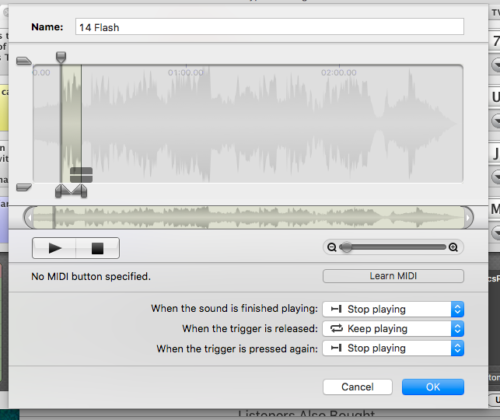 Farrago is a $49 (currently at $39, but will go up soon) Macintosh application from Rogue Amoeba software that can be used to reproduce at the touch of a mouse button sound clips. “So what?” I hear you say? “Big deal” you might exclaim. Well for those who create audio or need to use and reuse sound clips on a regular basis this IS a big deal. In the interest of fairness though, I should mention that I’ve been part of Farrago’s beta program and made several suggestions (that I’m sure others made as well) to the final product. Mac users know that there are certain programs for the Mac that define the genre in which they exist. On the high end there’s Adobe’s Photoshop, Final Cut Pro, and even Microsoft’s Office. These are examples of the standards in their areas that everyone refers to even if they don’t use it themselves. Then there are programs that may not have a universal audience, but still characterize where they exist. WordPress for websites, Handbreak for ripping (legally owned and only for your own consumption) movies, iMovie and so on. Audio software has its own niche areas. Professional music producers (on the Mac) really seem to like Logic Pro, many podcasters like GarageBand or Audacity, and let’s not forget Rogue Amoeba’s other audio programs like Audio Hijack and Loopback. For sound clips though there was really just one program that nearly everyone used and that was Ambrosia Software’s Soundboard. We used it because in its time it was best in class for podcasters and others who needed to be able to reproduce sound clips reliably and without a hiccup. To be able to quickly edit down to the exact sound required and in its day, it did it well. However Soundboard has not been updated for quite some time and while it still works (for now), the best description I can give to its interface is…creaky. It feels old and the user interface (UI) is non-intuitive to a novice. Before I even knew about Farrago, I had been searching for a replacement, but most of the alternatives that I tried either had many of the same problems or just didn’t feel right. Granted, this is a personal opinion, but Farrago felt right almost from the first beta that Rogue Amoeba sent me. So let’s talk about why Farrago should be your sound clip program of choice over Soundboard. 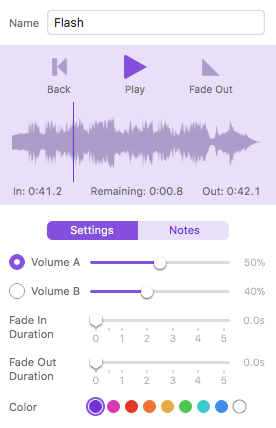 Both applications have a tiled interface which is pretty standard, but Farrago also gives you a list view if that’s what you prefer and a representative audio wave form, while Soundboard is just a rectangle. Soundboard however gives you more room for the title of the sound clip, which can be handy. Farrago though gives you the length of the clip at a glance and while its playing, how much longer the clip will go until it ends, while Soundboard does not until you hit the clip and then only tells you how long until it’s done. Farrago’s method is very handy to know, especially when timing between clips or the next spoken word is critical. Both show keyboard shortcuts to start a clip. Soundboard’s shortcut tile is HUGE while Farrago’s is center-bottom. Which you may prefer is a matter of taste. I have no preference since I rarely used keyboard shortcuts in the past. Both offer multiple tiled windows to fill with sound clips. Soundboard does it with an old school tabbed interface across the top with a limitation of six tabs (more can be accessed, but you don’t see them on screen). Farrago’s is in a sidebar (which can be hidden if you prefer) with nearly as many sets as you want. Navigation is in my opinion easier with this approach. 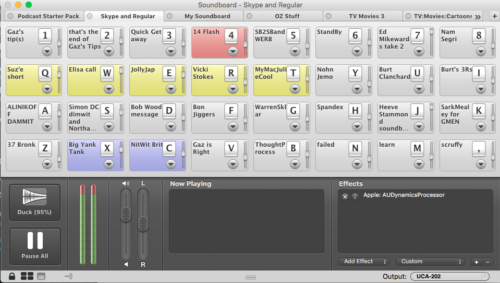 Soundboard also tries to cram as much functionality into each tile ,which does work, but this makes it very busy. The edit button (to do any editing…duh) is on the bottom right of each clip, which sends you into a completely different window. Farrago takes a different approach that makes editing much faster. Farrago has a slide out inspector that is available at the top right of the main window. Soundboard’s editing is done is such a way that you can only really edit one at a time and the rest of the program is pretty much disabled until you finish and close the editing window. You can jump to any Farrago sound clip to edit and still have all the functionality of the main program. One improvement to Farrago I would like to see in the future is the ability to stretch or compress each clip to edit for more precisse and detailed editing. Soundboard does this much better. Soundboard also has more options when it comes to fade ins and outs, but Farrago’s is more detailed and easier to set up. 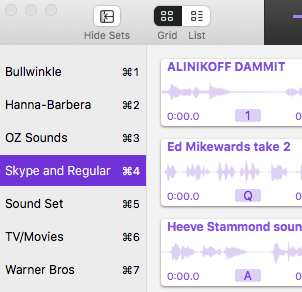 Some of Soundboard’s features seem pretty awesome, like being able to use a variety of Apple Audio Plug-ins, but in practice I used them sparingly or not at all. Not having them in Farrago doesn’t bother me and I would not recommend any particular effort be made by Rogue Amoeba to put them in. Soundboard also has a pan right and left control while Farrago does not and I would recommend that Farrago does add this. Another feature that Soundboard has and Farrago does not is the ability to add ducking. However Soundboard’s way of making this work is a bit of a mystery and I could never get it consistently. One way Farrago could do it better would be to have it “watch” an audio input and duck audio when it’s present. While I may seem a little critical, Rogue Amoeba’s Farrago is actually one of the better first generation programs I’ve seen in a long time. 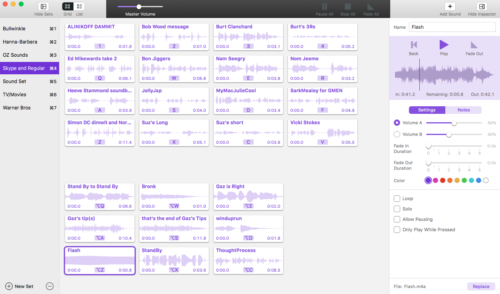 If you need an audio application like this, I would recommend it over other competing software.